Meg's Food! 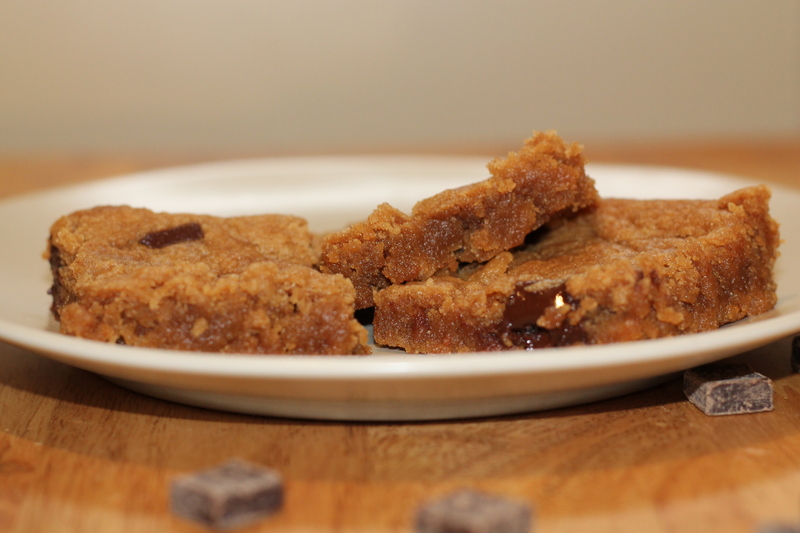 | Peanut Butter Chocolate Blondies - Meg's Food! 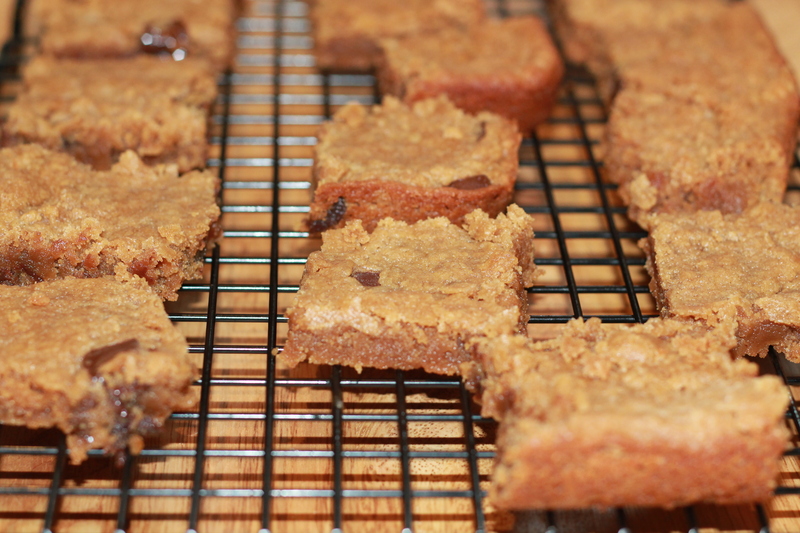 The thing I love most about these blondies is that they are so easy to make. And they’re fudgy. And peanut buttery. And gooey. And chocolately. And vegan! Ok so there are a lot of things to love about these delicious little squares. You make them in one bowl in about 10 minutes, cook for about 20, and you’ve got a plate of chewy, fudgy blondies bursting with peanut butter and sprinkled with dark chocolate chunks. I made these on a rainy Saturday while stressing about all the school work I have to do, my brain buzzing with wound care techniques and relational theories. They proved to be the perfect study break because they were so quick and easy to make, I had all of the ingredients, and at the end I got to treat myself to a blondie (or two. Or five). If you aren’t vegan you can use normal milk in these but I love that they’re vegan; they’re such a rich, flavourful dessert, they’re perfect for convincing people that vegans can have delicious desserts too! The tiny bit of sea salt on top is optional, but the sweet-salty taste it gives these blondies takes them over the top. I used no-stir, sugar and salt added peanut butter (i.e. Jif, Kraft, Skippy). If you want to use natural peanut butter, make sure you really stir it up before adding. The texture might be slightly different. In a medium bowl, stir together peanut butter, oil, and brown sugar with a rubber spatula until combined. Add milk and vanilla and stir to combine. Transfer dough to brownie pan and press to the edges – it won’t expand as it bakes, so make sure it’s evenly distributed in the pan. Bake 15-20 minutes. You want the edges just starting to brown – mine only took 15 minutes, but my oven is pretty aggressive. The middle will look a bit undercooked but it will set as the blondies cool. Let cool completely. Sprinkle with just a tiny bit of sea salt and cut into squares. Packed with peanut butter and chocolate, these blondies are like a fudgier, gooier peanut butter cookie. And the fact that they’re vegan and come together in just half an hour makes them even sweeter! 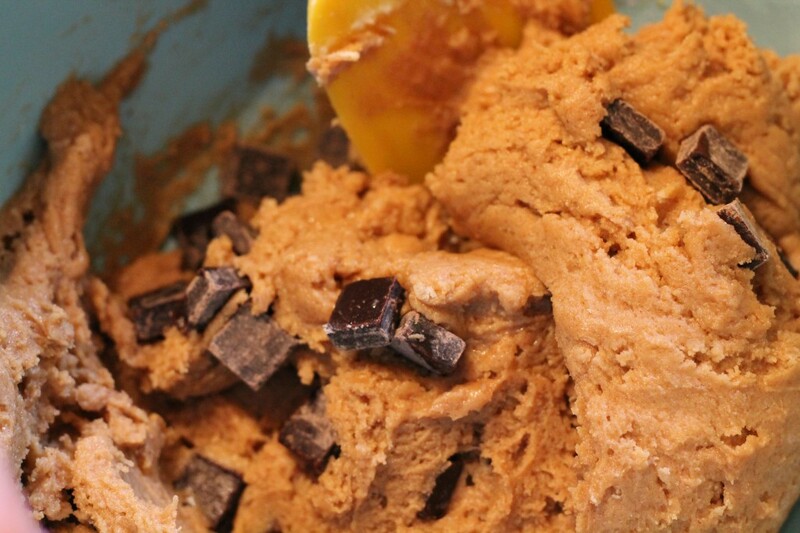 This entry was posted in Recipes, Sweet and tagged blondie, chocolate, dessert, peanut butter, vegan. Bookmark the permalink.